Clearer Navigation: We’ve created a new navigation system that allows you to move directly to the specific service you’re looking for with fewer steps. Where previously you would need to select ‘Security Services’, then ‘Business’ or ‘Home’ and then the service, for example ‘Burglar Alarms’, now all services are listed in the left hand navigation menu, allowing you to select one and then choose from a ‘Business’ or ‘Home’ service. 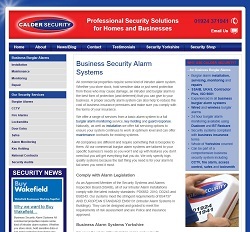 Quick Guide: Each service now has a quick guide entitled ‘Why Use Calder Security?…’. This gives you a quick overview of the key points without having to read through the whole section. News and Blog Combined: We’ve combined the previously separate News and Blog pages to provide a more streamlined area for the latest news and developments at Calder Security. Meet the Team: We know that service is important to our customers and that you want to be assured about who is coming into your home or business. Our Meet the Team page gives you a quick introduction to everyone who works at Calder Security so you can put some faces to the names! Customer Testimonials: We’ve added a page for some of the glowing customer testimonials that we receive. We’ll shortly be adding some more detailed case studies to this section so watch this space! Mobile Friendly: We’ve created a mobile friendly version of the website. The site is responsive so it detects what device you are viewing in on and then reformats accordingly. Therefore whether you are viewing from the comfort of your office computer or on a mobile because you find yourself locked out or your burglar alarm is going off, you should be able to view the site perfectly and find what you need quickly. We hope that you like the changes that we’ve made and that your experience of using the site is improved. The website will continue to be developed and the Blog/News area will of course be continually be updated so please keep coming back and let us know what you think of the changes!